The Green Nature Resort and Spa is set in a tranquil spot, surrounded by gardens, with the mountainside as a beautiful backdrop. Next to this family-friendly hotel stands a fragrant pine forest, while a sand and shingle beach is a five-minute walk away. You can also swim in the two pools at the Green Nature Resort Marmaris. The resort is barely a kilometer away from the Aqua Dream Waterpark and the resort has 631 rooms distributed across five floors. It is only 3 km away from the lively centre of Marmaris. There are several bars and restaurants located within walking distance of the hotel. This all-inclusive resort offers buffet meals and a la carte menu at its restaurants, besides a choice of beverages at its bars. There’s a mini market on site for your shopping needs. You can unwind yourself on holidays to Marmaris by booking a spa session in the sauna or soak in a Turkish bath. If you’re feeling sporty, play tennis or billiards, while the kids spend time in the playground. Green Nature Resort and Spa in Siteler is surrounded by beautiful gardens, which makes a serene atmosphere. 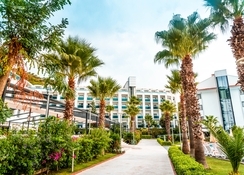 It lies only 3 km away from the centre of Marmaris, making it convenient for the guests. 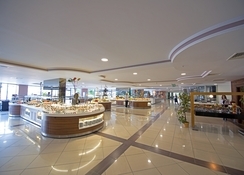 The Dalaman airport is about 98 km away from the resort. Green Nature Resort and Spa has a total of 631 standard and family rooms, spread across five floors, mostly overlooking the pool and a pine forest. Green Nature Resort comprises two buildings, the main resort built in 2007 and the Club section renovated in 2006. While the Club building is of 4-star standard, all guests have access to 5-star facilities of the complex. Green Nature Resort & Spa has a buffet restaurant, where you can enjoy a five-course meal, an a la carte restaurant, a snack bar that serves pizzas, burgers and more. You can also look forward to a buffet by the poolside and theme dinners. Enjoy a drink at any of the bars, including the club lobby bar, the Garden bar, the resort lobby bar and the 24-hour Amphi bar. 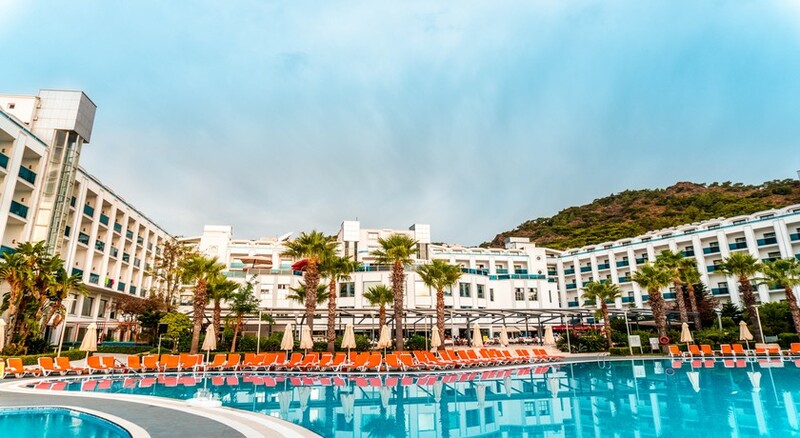 At Green Nature Spa and Resort, you can have a fun-filling Marmaris Holidays with outdoor swimming pools, with one just for kids, an indoor heated pool and four water slides. You can also play table tennis, tennis, volleyball and indulge in water gymnastics, Bingo and pool games. In the evenings, you can look forward to live entertainment, dance shows and theme nights. There’s also a well-equipped gym and wellness centre, where you can spend time in the sauna, enjoying a Turkish bath or Jacuzzi. The exclusive kids’ club conducts fun workshops for the little ones. Canoeing and water-skiing is available and you can discover the Atlantis Waterpark, Sedir Island and spend time at the Dalyan River which are nearby to the hotel. We had a wonderful time at the Green nature resort. The kids loved the hotel. Food was amazing and staff were really nice. Had a fabulous holiday here in April, so much so i’m Returning next year with kids & grandkids for a huge family holiday. Facilities were excellent, food was nice, staff were friendly & helpful. Special thanks to Emin who helped make this a special holiday. Only negative, no wi-fi in bedroom. Green nature resort was an amazing hotel the staff were really friendly the cooks were really friendly the waiters were really friendly.. the cleanliness of the hotel was amazing the pool was nice and clean good gym and spa services. We enjoyed our stay there and the kids loved it to would definitely recommend to anyone wasting to go to Marmris to stay Green Nature Resort. Had the best time here, so excited to go back! Staff were lovely, always looked after. Facilities are amazing, can't believe there was even a tattoo studio on site. The shop keeper was lovely, always sorted us out with what we wanted/needed. Honestly can't wait to go back. And the food was amazing everyday! Stayed at the Green nature Spa and hotel. Had the most amazing time. Food and drinks were amazing. Hotel staff were very friendly and had so much energy. Their cleanliness and food hygiene is by far the best I have come across. Would definitely recommend and I will definitely be staying there again!